Hello family and dear friends!! 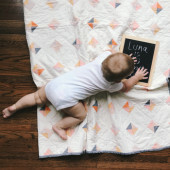 Thank so much for loving our little Luna and for taking the time to look over our gift wish list for our little moon! These are items that Luna would enjoy as she approaches her first birthday and beyond. Our little Luna loves to play and these gifts will help further her creative explorations and wonderment in the world! Thanks for taking a look!